If you need help call 911! GPVFD is part of the 911 network! Thanks for your support! Someday we might have to be there for you, and we want to be prepared. See what we do...on youtube! Just like its name says, the Glade Park Fire Department is completely VOLUNTEER. The firefighters donate their time for training, equipment preparation and care, fundraising, rescue, and fighting fires, and probably a few things I have left out. They do not do it for the prestige and recognition. In fact they asked to not be listed individually. If you would like to become a firefighter, make a donation or volunteer to help at the movies, call Rich or Deb Trotter (970)216-9116 OR tgladepark@aol. Triangle Complex Fire - Glade Park 1995 This is Moorland Canyon, the site of my family's original homestead. Although there was not much left, the fire swept away the last remnants. What can the homeowner do to mitigate the loss of a home to wildfire? The beauty and seclusion of being surrounded by a natural forest can shift to terror and loss if a range fire ignites near your home. 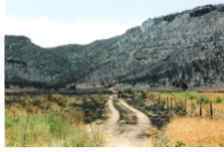 Over the years Glade Park and Pinon Mesa have had some wildfires roar through the area, burning brush and trees, and threatening homes. As more homes are built, the odds of loosing structures in the face of a wildfire increase. However, homeowners do not have to feel powerless over what will happen if a wildfire advances toward your home. By thinking ahead (way ahead), and taking steps to protect your property, you can greatly improve the chances of keeping the fire demons at bay. Many of us have narrow dirt roads leading to our homes. Although this may be adequate for our own access, will it accommodate a fire truck? Is there room for a fire truck to turn around? If the Glade Park Fire Department cannot get to your home, and get turned around to exit, possibly in a hurry, there is not much they can do to help you. They cannot risk the lives of firefighters. Contact them to find out what you need to do to accommodate their services. If you are building your own home, you can choose materials that are less flammable. The most obvious is a metal roof. That is only a start! You also need to assess the surrounding landscape. How close are the trees and vegetation to your home? If you are ready to take this issue seriously, check out this link. It includes some great material on assessing your risk, and detailed instructions on what you can do to lower it. I recommend “Is Your Home Protected from Wildfire Disaster” and “Wildland/Urban Interface Fire Hazard Assessment,” which are available on this “Firewise Communities” website.